Falls are a significant cause of serious injuries. You don’t have to fall far to be injured or even killed. For your own safety, you should know the basic types of fall protection and what works best for each situation. The basic types are guardrails, travel-restraint, fall-restriction, fall-arrest, and control zones. Guardrails are excellent methods of fall protection because they remove the risk of falling by putting a barrier between the employee and the edge. See Safety Talk No. 8 – Guardrails. A travel-restraint system keeps you from getting too close to an unprotected edge. It restrains your travel to prevent you from falling. When you get to the open edge of a floor or roof, the system holds you back. A travel-restraint system is an assembly of components designed to prevent the employee from reaching an unguarded edge. The system consists of a lanyard, a lifeline and a safety harness or belt. The lanyard and lifeline are adjusted to let you travel only so far. 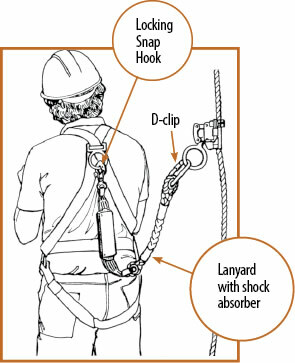 The safety harness or belt attaches to the lifeline directly, or through a rope grab. A fall-restricting system is a combination of a work positioning system (a bosun’s chair, a swing stage, a work positioning belt, etc.) and fall-restricting equipment (rope grabs, fall arresters, lineman pole climbing belts). A fall-arresting system keeps you from making contact after you have fallen. It arrests your fall. An unguarded work area that is more than 3 metres above the nearest safe level. An unguarded work area that is above any surface or thing that could cause injury to you upon contact. An unguarded work area that is above any open top tank, pit or vat. A work platform that is 3 metres above a permanent, safe level. Any work area where a health and safety officer has determined that it is necessary. A fall-arresting system must limit the total fall distance to an amount less than the distance from the work area to any safe level, water or obstruction below, as well as limit the impact on the body of a fallen worker to 8 kN. This can be accomplished by using a shock absorber or by limiting the free fall distance to 1.2 metres. It consists of a lanyard and a strong anchor. 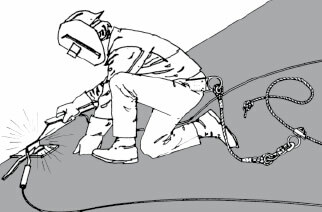 The anchor for an individual fall-arrest system (for one person only) must be capable of withstanding a force of 22 kN – approximately the weight of a mid-size car. The lanyard can be connected to the anchor directly or through a lifeline system. Before an employee is allowed into an area where a risk of falling exists, an employer and a contractor shall each ensure the employee is instructed in the fall protection system for the area and in the post-fall rescue procedure, if applicable, and that the employee is competent in the procedures to be followed. Because the employee will need to be rescued quickly, a rescue plan must be developed ahead of time so you are prepared. The fall-arrest equipment must be removed from service and inspected by a competent person and repaired to the designers’ or manufacturers’ specifications before it is returned to service. Travel-restraint and fall-arrest equipment should be approved by the Canadian Standards Association (CSA). A control zone may be used where it is impracticable to use a fall protection system, however it is not allowed on a surface with a slope over 3 in 12 and on a scaffold. A warning line as part of a control zone must be set up 2 metres from an unguarded edge and employees working in the control zone must use another form of fall protection. In New Brunswick, the law on fall protection can be found in Regulation 91-191 of the Occupational Health and Safety Act.